There was a lot of handwringing from commenters last night about the demise of Pontiac. Whether you buy it that the Federal government forced General Motors to kill it, or you think that GM killed the brand themselves, it was the right thing to do. I would've done the same. And here's why. You know I don't actually blame the Feds or GM for this one. While we love big RWD V8s, this looks to be purely a business decision. Think about this way. Every year the US Army, the Navy, Air Force, and the Marines submit their huge annual budgets for Congressional approval. They're actually more wishlists than actual budgets. Most programs are approved, some are even expanded depending on the politics of it (and who is the sitting chairman of the House Appropriations committee and what jobs are coming back to their district, etc. ), but some programs are always cut. As the military knows that some line items in the budget are always cut, they purposely insert a few programs that they know they can stand to lose. Like the Airborne Laser. Does the Air Force really need a giant ridiculous laser strapped to the front of a Boeing 747 for its current and any foreseeable needs? Of course not. The Taliban ain't getting ICBMs anytime soon, and when the Russians or Chinese or whoever does decide to launch them at the US, they're going to launch hundreds, if not thousands of missiles. So one little Boeing 747 with a ridiculous laser taking potshots one at a time isn't exactly going to cut it. But when Congress comes back to the military and they say "we need to cut five billion from the budget to make the math work," the military goes "well what about this airborne laser we got?" And Congress okays the cut, so they're happy, and the Air Force loses a program it never really wanted but they get to keep everything else, so they're happy. Pontiac was the Airborne Laser of GM. GM clearly needed to cut a division of the company – that was just good business sense. Even Lutz admits this. Would he admit that they offered up Pontiac as a sacrificial lamb? No, of course not. But it makes total sense. Yes, you could have sentimental value attached to the badge, but the cars that were planned we're still all getting. They're just being badged as Chevys or Cadillacs now or what have you. The bean counters got what they want, and the enthusiasts got what they want, and nobody really lost anything. With Pontiac gone, everyone goes home happy. We can expand upon this theory in a purely business sense though, beyond ideas of sacrificial lambs or hypothetical planning sessions. The simple fact of the matter was that Pontiac was not making money. Put yourself back into the days of early 2009. You're looking at the worst recession in generational memory. This great industrial titan of corporate America was barely breathing, and on life support. American consumers aren't buying anything, let alone driving anything. And when they may start to buy and drive again, they're going to do it frugally. When you're worried about the continuation of a massive company as a whole, one that not only employs thousands of workers on its own, but through its entire supply chain pipeline and everyone else peripherally involved, you try to cut out the disease to save the beast. You could say that the government killed Pontiac, or that GM killed Pontiac. But with Pontiac dead, GM lives. But when you have a car brand that has made no money, and you have nothing to show for it besides a track record of mismanagement, then it needs to be shut down. Sure, Bob Lutz can talk about how it was going to be saved, but it's not like the people responsible for mismanaging it would've all been fired in the first place. That's often not the way the world works, sadly. Pontiac would've continued, with many of its same managers. And even worse, Lutz was trying to save it with the big thirsty sedans that it looked like the average car-buying public wouldn't want for decades. So when you're a bean counter, and you're looking to save the company as a whole, and all you have is one guy saying he's going to turn it all around, starting with the worst brand in the stable, just wait and see, well then you're not going to stomach it for very long. And in a way, Pontiac can live. Pontiac never did anything another brand could never do. It can be recreated. 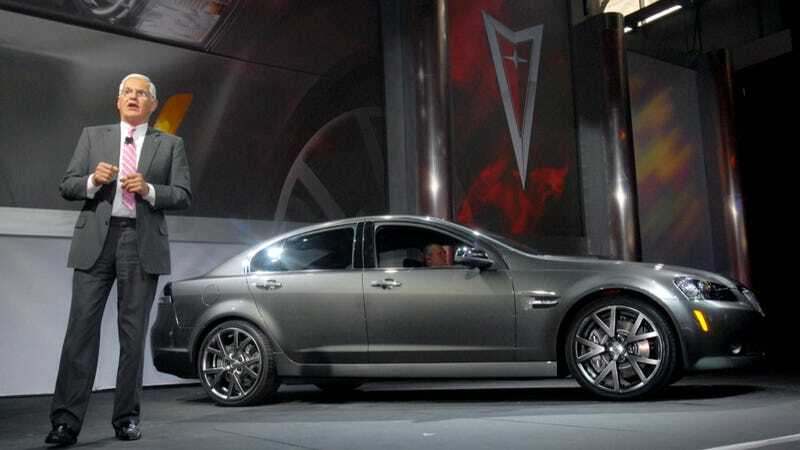 In the case of the Pontiac G8 GXP, it will live on as the 2014 Chevrolet SS. There's nothing stopping GM from bringing a downmarket, everyman's version of the Cadillac ATS to the car-buying public as well to create a Baby SS. Hell, they could even call it a Monte Carlo or a Bel Air. Yes, losing the GTO nameplate is tough, but we've lost many great monikers over the years, and we've created new ones. The world for the enthusiast in all of us will keep spinning. The simple fact of the matter is that, purely from a cold, hard, logical standpoint, some brands had to go. It's not something new to the automotive industry. There are still legions of fans of Oldsmobile, Studebaker, and hell, even the Stutz Bearcat around. If the GM executive board insisted on keeping everything, though, and the company completely failed, we wouldn't have cars like the new SS, the Corvette Stingray, or the Camaro ZL1 to show for it. Maybe it doesn't matter who killed Pontiac. But if you do think it matters, then maybe we should find out who was responsible. But only to call them a hero. The kind that makes tough decisions that need to be made.